Argus Heating design, manufacture, and distribute a range of IBC and drum heaters and accessories. 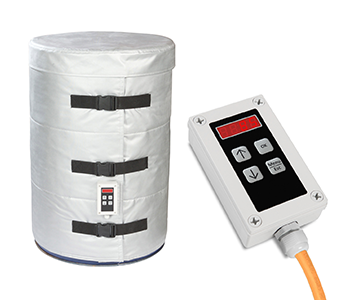 The high temperature metal drum heater jackets are specifically designed for high temperature applications. The insulated exterior minimises heat loss and a compact digital temperature controller ensures that you have an easy, efficient and economical method of heating and maintaining the temperature of your product. Optional insulated lid available. Caution: for metal drum applications only. ‍Metal drum heating jackets to suit 25, 50, 105, and 200L drums and products that can safely be raised to high temperatures. The jackets are fitted with a digital temperature controller, providing precise control from 0-200°C. Manufactured and tested in accordance with AS/NZS 3100. The approximate warm-up duration is 24 hours to raise 200L of water from +15ºC to +80ºC with a 1200W drum heater. Custom design heater jackets available on request. Durable high temperature silicone/glass fabric outer. Glass filament insulation. High temperature silicone heating cable. Easy quick-release buckles. Water resistant polycarbonate enclosed digital controller with a two metre power cord and moulded 3-pin plug. Insulated exterior minimises heat loss and the digital temperature controller provides an efficient and economical method of heating and maintaining product temperature.